of Seabrook, NH, formerly of Woburn and Hampton, NH, August 28th, at eighty eight years of age. Beloved wife of the late Donald E. Wormell. Loving mother of Cheryl A Graham, her husband Thomas of NH, Thomas J. Wormell of NH and the late Donald E. Wormell of NH. Viola was sadly predeceased by all nine brothers and sisters. Cherished grandmother and great grandmother of many. Relatives and friends are respectfully invited to calling hours 10 – 11:25 a.m. prior to the Funeral Service. 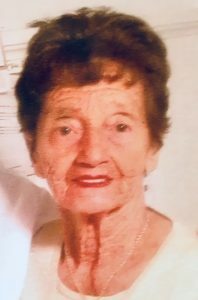 A Funeral Service will be held in the Lynch-Cantillon Funeral Home, 263 Main Street, Woburn on Wednesday, September 5th at 11:30 a.m.
Viola A. (Magliochetti) Wormell passed away at Beth Israel Hospital in Boston, Tuesday, August 28th. The beloved wife of the Donald E. Wormell Sr., she was eighty eight years of age. Born in Woburn, Viola was one of ten children born of the late Antonio and Lucia (Copini) Magliocchetti. Raised in Woburn with all her siblings, she married her sweetheart Donald Wormell Sr., and brought three children into the world. They dedicated themselves to raising their children and celebrating their Italian heritage. She was a wonderful cook, and throughout the years enjoyed spending time with her extended family. Viola always found time for her family and to spend time at the beach and have fun in the sun! She enjoyed many happy trips with her family and travelling on different cruises. As years went on, she and Donald would spend six months in Daytona Beach, FL and the other six months at Hampton Beach. For the last several years she has made her home in Seabrook. Sadly, Viola was predeceased by her parents, her husband Donald Sr., son, Donald Jr. and her nine siblings. Viola was the loving mother of Cheryl A Graham, her husband Thomas , Thomas J. Wormell, all of NH and the late Donald E. Wormell Jr. Cherished grandmother and great grandmother of many as well as survived by numerous nieces and nephews. Relatives and friends are respectfully invited to calling hours 10 – 11:25 a.m. prior to the Funeral Service. A Funeral Service will be held in the Lynch-Cantillon Funeral Home, 263 Main Street, Woburn on Wednesday, September 5th at 11:30 a.m.
Rest in peace Vi. I will miss seeing you at the beach, Hampton won’t be the same without you. Sorry for your loss Tom. Your in my thoughts and prayers. Tommy and family ! Sending love and prayers on the passing of your Mom! May she Rest In Peace and May Peace find its way to all of you ! Richard and Cara Waite would love to give our deepest sympathy to the whole family…. We were so glad we got to meet her….. She was a very sweet woman…. She is now an angel watching over all of you…. May she now rest in peace….